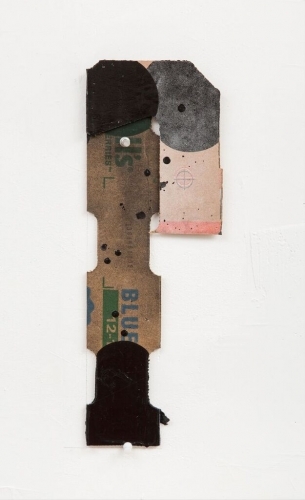 George Negroponte's New Army (Enamel & latex on cardboard, 14.5" x 5") is now on view at The Curator Gallery as part of the group exhibition, New New York: Abstract Painting in the 21st Century. February 23 - April 15, 2017. Curated by Liam Davis and Debra Drexler. A renaissance of abstraction has recently surfaced across New York. The sine qua non of modern art, abstraction fell out of favor in the late twentieth century with the emergence of postmodernism and its concepts of paradox, pastiche and deconstruction. But at the beginning of the 21st century, abstraction has risen from the ashes of its professed death with a power and potency rivaling its inception. This phenomenon is not a return to modernist history, but is specific to our current century. The reasons for the resurgence of abstraction and its new approaches are considered in NEW NEW YORK.